Thursday's NBA on TNT regular season doubleheader coverage will showcase two conference matchups, beginning with the Eastern Conference-leading Boston Celtics and All-Star Kyrie Irving visiting the New York Knicks and breakout star Kristaps Porzingis on Thursday, Dec. 21, at 8 p.m. ET. The San Antonio Spurs and two-time NBA Defensive Player of the Year Kawhi Leonard will take on the Utah Jazz and high-scoring rookie Donovan Mitchell in the network's second game at 10:30 p.m. 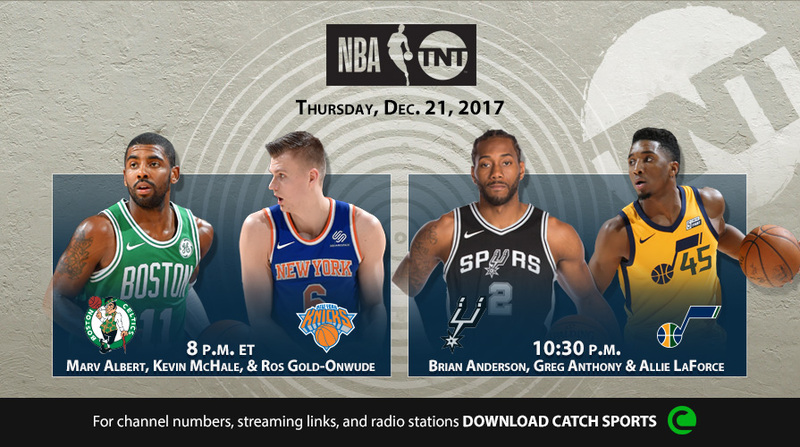 Following Thursday's doubleheader, NBA on TNT coverage will return on Monday, Dec. 25 and showcase a Christmas night telecast – Timberwolves vs. Lakers – with Ernie Johnson, Charles Barkley, Kenny Smith and Shaquille O'Neal calling their first ever game together at 10:30 p.m.
• Throughout Thursday's TNT coverage, Kevin Garnett will be joined by sharpshooters Rip Hamilton, Dale Ellis and Cappie Pondexter on Area 21. Select Area 21 segments will air on TNT, with additional content running on Facebook and Twitter. • Marv Albert (play-by-play), Kevin McHale (analyst) & Ros Gold-Onwude (reporter) will call the Celtics vs. Knicks telecast at 8 p.m.
• Brian Anderson will provide play-by-play for Spurs vs. Jazz, alongside analyst Greg Anthony and reporter Allie LaForce at 10:30 p.m.